"Focus on what matters" has two meanings for us. First, it is a statement about life. Second, when it comes to a TSP strategy (or 401K/IRA strategy) is about results, risks and simplicity. It is also about avoiding the hype and focusing on what will truely provide you with the largest nest egg when you decide to retire and continue to grow during retirement. Two hundred years of market history shows us there will be more bear markets and more bull markets in the stock market. 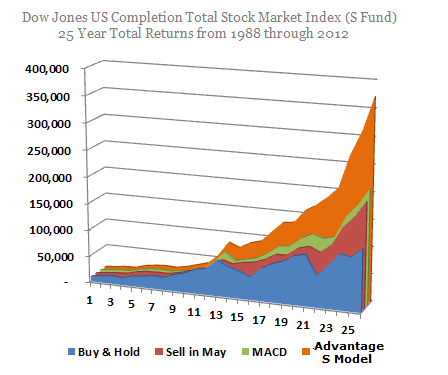 You have to focus on the full market cycle and not 3 or 5 year returns advertised so readily. If you find a simpler, safer or smarter allocation strategy for your investments–follow it. If your current financial advisor helped you step aside during the last bear market–stick with him. If not and you want to avoid significant losses to your funds while maintaining the gains, please take some time to read our Learning Center. I hope it helps you understand how our simple modified buy & hold strategy can help you sleep better during turbulent markets while growing your nest egg. Many investors have a hard time believing that re-allocating only twice a year could significantly increase their nest egg. 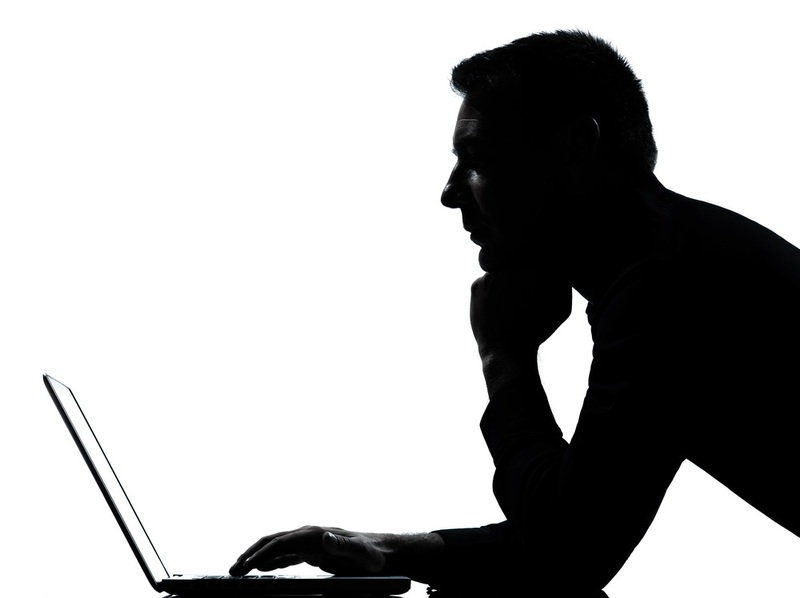 How could a strategy so simple to execute work and will it continue to work. We spent a lot of time comparing timing strategies and found what we consider to be the best one for index funds. It has both academic support and real world evidence as seen in the Dow Jones Indexes over the last hundred years. We optimized the strategy for investing in TSP funds to be both simple-to-execute and significantly beat the buy-and-hold investor. There are no black boxes or emotional decision-making, just a straight-forward approach simple to understand. While we use the same strategy for both the S&P 500 (TSP C) and Small Cap Indexes (TSP S fund), we found they needed separate timing signals based on the index they track. Our members receive an email at least one day prior to the allocation change date for the fund or funds they are investing in. All you have to do is log onto your government TSP account on that date and make the re-allocation twice a year. It’s that simple and the historical results speak for themselves. The TSP S Fund tracks the Dow Jones US Completion Total Stock Market Index, or basically the whole US stock market minus the S&P 500 index. 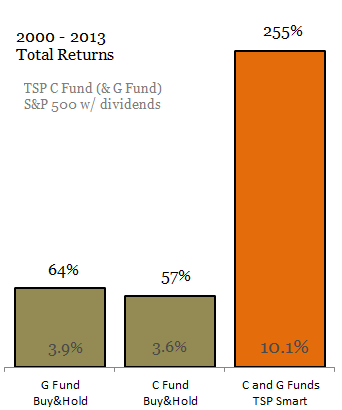 The TSP C Fund tracks the S&P 500 index. The graph above shows what a one-time investment of $10,000 would have returned over 25 years from 1988 through 2012. The returns include dividends and G Fund returns when not invested in the equity fund. 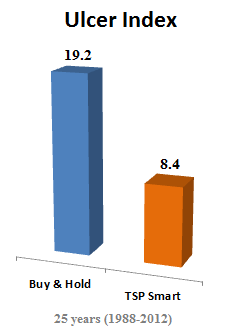 Blue represents a buy and hold investor. Note the difference in an investor’s nest egg after 25 years for each $10,000 they invested. Why doesn’t everyone follow this strategy? Many investors are too busy chasing short-term returns published by the financial community not always realizing one company will start 10 funds with different strategies and close the losers after a few years and only advertise the winners. Research also shows the best performing funds often turn into the worst performing funds simply because of the changing tides of investing. Many investors trade on emotions generated by both the financial news media and the performance of their funds. The typical retail investor has the highest exposure to equities at market tops and the lowest exposure at market bottoms, exactly the opposite of where they should be. Research by JP Morgan estimates the average retail investor earned a 2.3% return over a period of time when the S&P 500 earned over 8%. Investing based on the news of financial and economic reporting is like trying to drive a car by looking in the rear-view mirror. While TSP GOV limits your investment options, we have come to embrace them as the best vehicles for investing your core retirement funds. They are extremely low cost and you can achieve the diversification of the whole US stock market. This eliminates much of the risk in investing and leaves you only with market risk or basically as goes the market so goes your funds. This led us to focus on the best overall strategy for mitigating market risk while maintaining our gains. 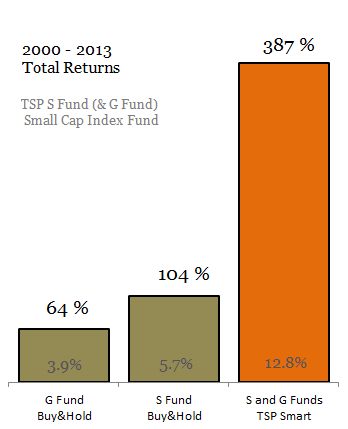 Note: The TSP L Funds do not mitigate risk, they merely diversify it. 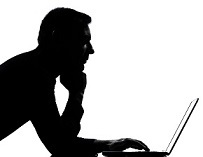 What surprised us the most when looking at all the strategies, timing newsletters and market analyst was that even the professionals could be used as a contrary indicator. Financial newsletters and analyst are at their most bullish at or near market tops and at the most bearish at market bottoms. This is one of the reasons very few beat the broad index funds over the full market cycle. Simply put, to buy and hold a diversified low-cost fund is much better than subjective trading. So we wanted an objective strategy that worked in all kinds of market environments. We did this by developing a modified buy and hold strategy that captures most of the market gains while avoiding most of the large drawdowns in your funds over the full market cycle (bull/bear markets). Not focusing on 1 or 3 year returns allows you to take the long view of the full cycle and select a strategy that significantly and conservatively beats the buy and hope investor. How about market fundamentals? The market can stay over-valued and under-valued for decades. Surprisely, it has a propensity to become over-valued in secular bull markets and more under-valued in secular bear markets instead of just reverting to its mean value. It might also surprise many investors that the last time the market was at its historical mean value was at the market bottom in 2009. The bottom! The easy money policies of the Federal Reserve have pushed investors out of the safe low risk investments into the riskier stock market with the expectation of continued high returns. 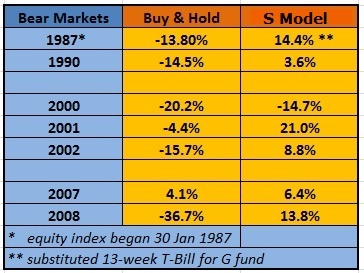 When the current cycle ends investor returns could be lower than if they stayed in cash - yes cash does have the best returns during bear markets. What we think you will like most about this strategy is that not only has it beaten the other strategies head-to-head, but when you look at the risk-adjusted return, it blew the others away. It does this by flipping conventional investing advice on its head. Instead of increasing risk to increase returns, you REDUCE your risk to increase your returns. But what does risk really mean? What is risk? While there are hundreds of measures for investment risk, we like to keep it simple. We simply want to focus on avoiding significant losses to your investment funds while maintaining most of the gains. If you can do this over the long-term, you will double or triple your retirement nest egg. 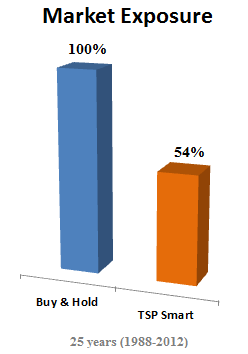 In the graphs below, blue represents a buy & hold investor and orange represents our simple two allocations per year strategy’s performance. The ulcer index is a stock market risk indicator devised by Peter Martin and published in his book The Investors Guide to Fidelity Funds. It measures only the volatility of an asset in the downward direction; in other words, only the amount of drawdowns over a period of time. 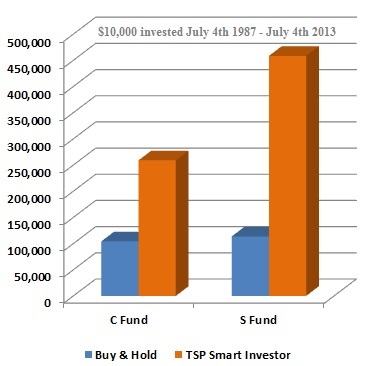 What is amazing about the performance of the TSP Smart strategy is that it turns the efficient market hypothesis on its head. Academia and most financial advisors will try to tell you that to increase returns you have to increase risk, while this is partially true, the TSP Smart strategy INCREASED returns by REDUCING risk. for articles on TSP Share Price performance.